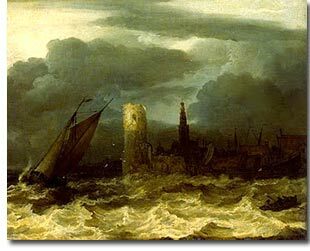 Allert van Everdingen (1621-1675) studied in Haarlem and devoted himself to landscape, but painted also sea pieces and storms with' surprising effect, and represented the tempest-tossed waves with awful and terrific fidelity. His love for the sea led him to take a voyage to the Baltic with a friendly captain - a fateful voyage, for he suffered shipwreck. Still he was amply repaid by the profound impression the rocky coast of Norway made on him. While waiting far repairs to the vessel he sketched assiduously the romantic wilds of those regions, the grand forms of rocks, and the picturesque waterfalls. On his return he was completely enamoured with what he had seen, and working out his sketches, he was soon called the "Salvator Rosa of the North." It is most likely that to him is owing the desire for those waterfalls and solitary woodlands wherewith his more famous townsman Jacob van Ruisdael varied his local scenes. Allert's paintings are very attractive. His colouring is simple and pure, his touch broad and facile, and his scenes are full of out-of-doors.